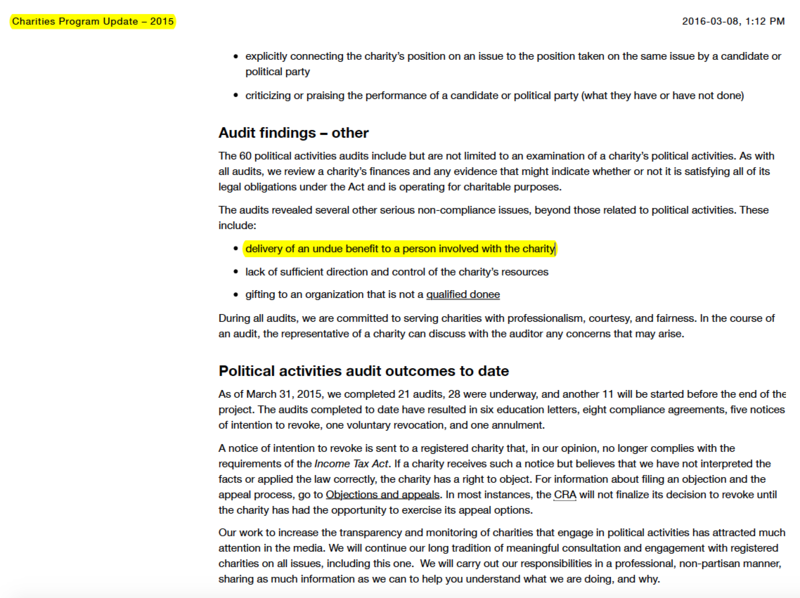 Much to my surprise, it is time to ask questions of the Canada Revenue Agency (CRA) with regards to its handling of the audits of political activity of registered charities, and more broadly, about its oversight of the Charities Directorate in general. Back in 2012, the CRA began a series of political activity audits when the Conservative Party of Canada was in office. The charity that was at the centre of the fuss was Tides Canada. For background, see The CRA Audit of Tides Canada: Why The Stakes Are High. Over and over, Tides Canada has denied any wrongdoing. “We are fully compliant with The Income Tax Act, all CRA guidelines regarding both domestic and international funding,” Tides Canada’s CEO, Ross McMillan, told Evan Solomon in a CBC interview in 2012. With a staff of 250 and an annual budget of $29 million, The CRA’s Charities Directorate oversees 86,000 registered charities that report nearly $16 BILLION per year in tax-receipted revenue. 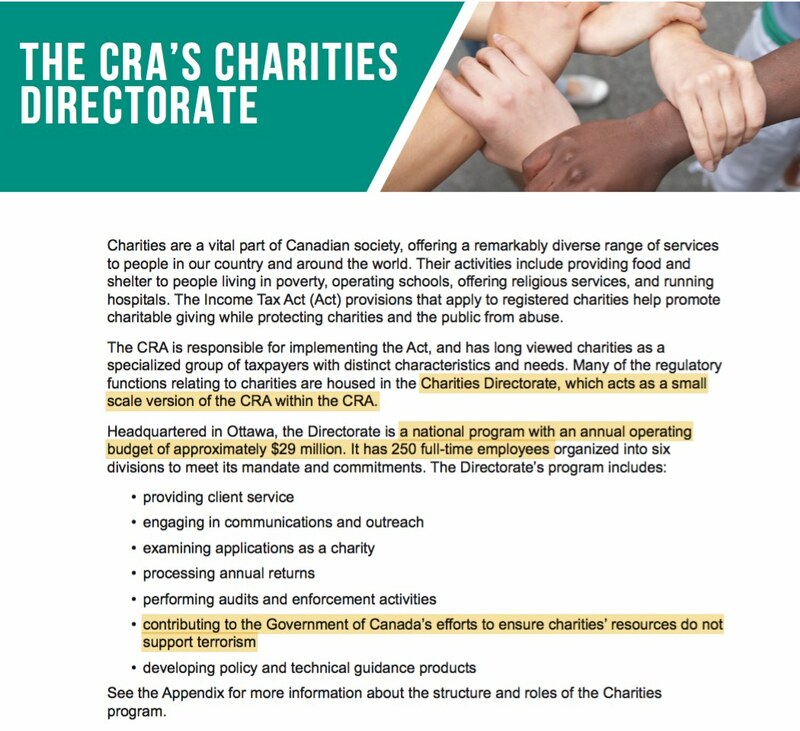 The Directorate calls itself “a small-scale version of the CRA within the CRA,” and audits roughly 800 charities per year. Before the political activity audits were brought about, information was provided to the CRA about two issues: 1) anti-pipeline activism, and 2) questionable payments (explained ahead). In the media, the political activity audits have been ridiculed as a witch hunt meanwhile investigative journalism about the questionable payments has been scant. Between 2010 and 2016, the Charities Directorate did 4,615 charity audits and issued 182 notices of revocation, the CRA as said. Roughly four percent of audited charities have been shut down. 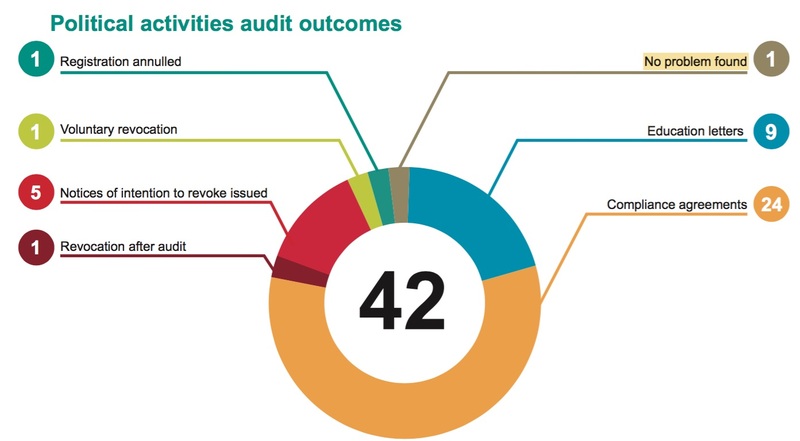 Of the 42 charities that were audited for their political activity between 2012 and 2016, 41 were not found to be compliant, the CRA reported in December of 2016. Most of the problems found were minor. 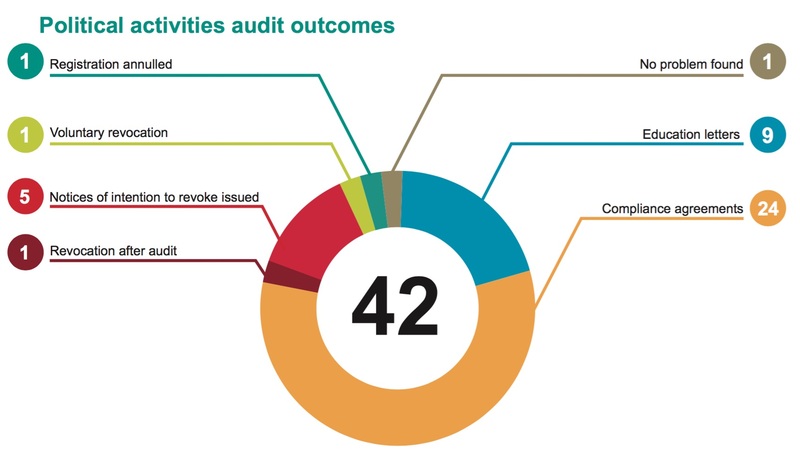 However, with more than half of the audited charities, the CRA did Compliance Agreements, indicating that a moderate or severe level of non-compliance was common. In keeping with the privacy provisions of the Income Tax Act, the names of the audited charities cannot be disclosed by the CRA. In at least five cases, the CRA ruled that the charity should be closed (status revoked). It has since been reported by the CBC that seven charities, not five were slated for revocation. This level of non-compliance is roughly triple what the CRA has found in the course of routine audits over the past six years. What about the charity that was at the centre of the fuss? What about Tides Canada? Six years on, it continues. So what were the results of its much publicized audit by the CRA? Given that extensive evidence was provided to the CRA as far back as 2010 and that the federal government provided at least $8 million specifically for audits of politically active charities, what little is publicly known so far about the CRA’s handling of its audit of Tides Canada is baffling. Tides Canada Not Audited Since 2009 ?! In the 2016 financial statements for Tides Canada, it is reported that the CRA’s audit of Tides Canada covered 2008 and 2009. What this appears to indicate is that the CRA did NOT audit the books of Tides Canada for any year since 2010. Tides Canada’s financial statements also appear to indicate that the Initiatives Society has been under CRA audit for six years and counting - but as it appears, it is under audit only for 2008 and 2009. Tides Canada has not replied to numerous requests to provide clarification about its audit by the CRA. Since 2010 when concerns were first drawn to the attention of the CRA, there have been three rounds of municipal elections, two provincial elections in B.C. and a federal election. In elections at all three levels of government, Tides-funded organizations have been active. Most recently, Tides Canada advertised to hire an employee to focus specifically on the 2018 municipal elections and the electoral reform referendum. In Vancouver, it isn't even clear yet who the mayoral candidates will be and yet Tides Canada is already hiring staff for elections activism. Over the years, Tides Canada has grown into a hefty operation. In fact, with annual revenue of $31 million and a staff of 225, Tides Canada is nearly the same size as the Charities Directorate at the CRA. 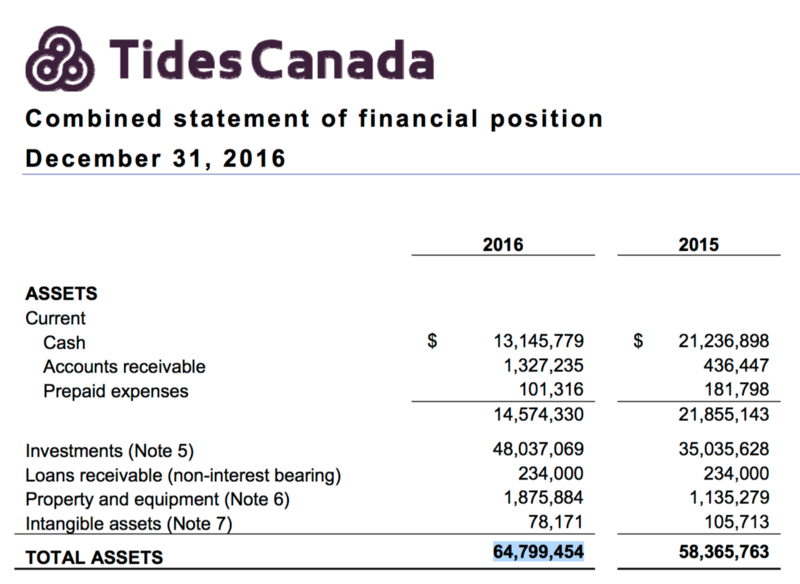 With $65 million in assets, Tides Canada earned nearly $2.5 million (2016) from investment income alone. That could fund a lot of activism, and other activities as well. Tides Canada operates as two registered charities, Tides Canada Foundation and Tides Canada Initiatives Society. The foundation has equivalency status in the U.S. and files tax returns with the I.R.S. whereas the society does not. In practice, what this means is that Tides Canada Foundation can receive U.S. funds and then grant them to Tides Canada Initiatives Society. In the process, the U.S. funds are "canadianized" such that the elections activism, for example, that Tides Canada Initiatives conducts can be reported as funded by a "Canadian" source. Also, in terms of its reporting to the I.R.S., Tides Canada Foundation can report its spending on its internal programs as grants made to Tides Canada Initiatives Society - and that's about it. How convenient. Over the past decade, Tides Canada Foundation has reported to the I.R.S. that it has "granted" a total of at least US$46 Million to Tides Canada Initiatives Society. These payments are also reported in the foundations Canadian tax returns. 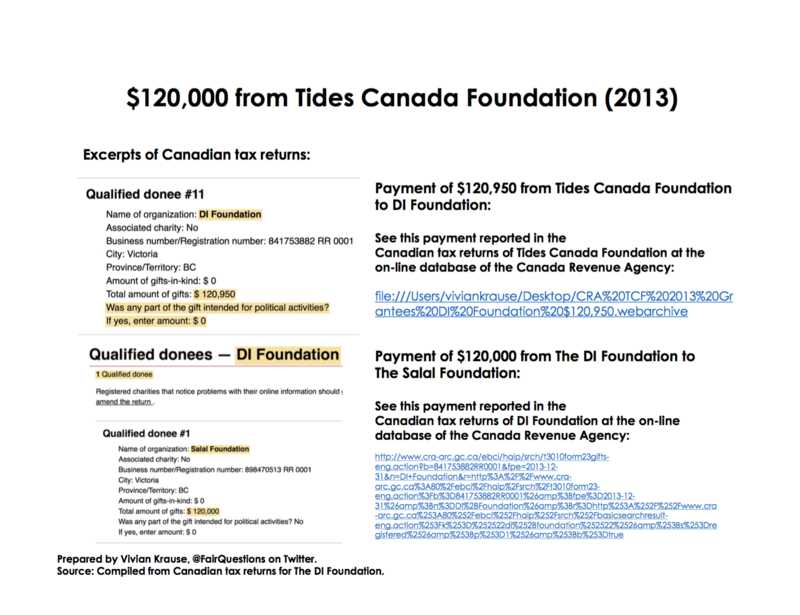 Most of the information presented here is from the U.S. tax returns for Tides Canada Foundation. This is because the I.R.S. requires greater disclosure than the CRA. Without recourse to U.S. tax returns, most of the analysis presented here would have been impossible. 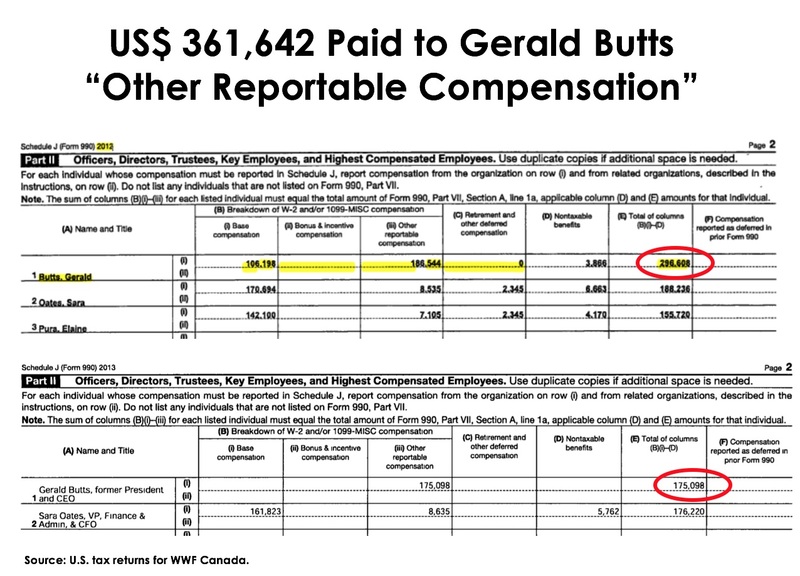 For example, the US$ 471,706 (2012 & 2013) paid to Gerald Butts by WWF Canada (details ahead) would not have come to light were it not for U.S. tax returns. 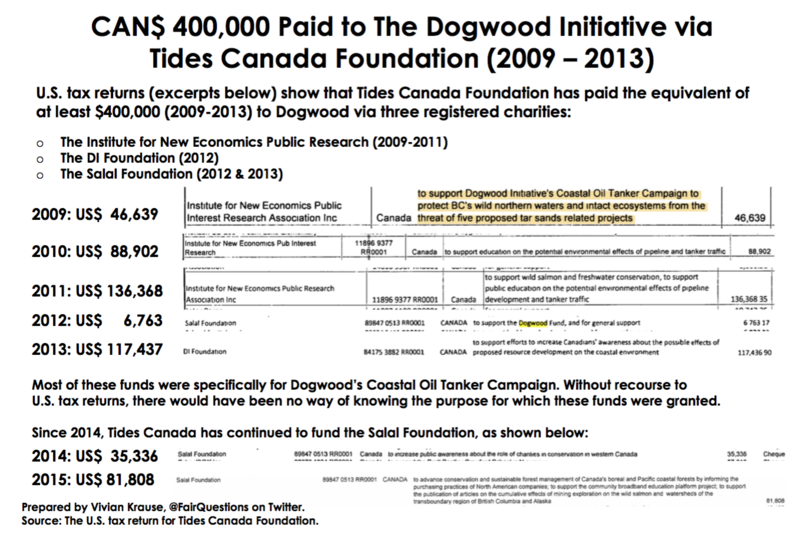 Had the CRA audited Tides Canada Foundation it would have found that Tides Canada has been funding The Dogwood Initiative (“Dogwood”), one of the most politically active organizations in the country. 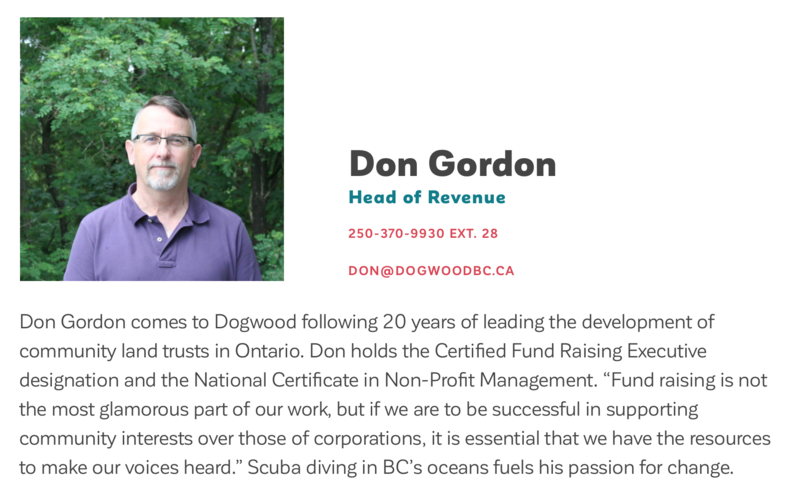 Based in Victoria, B.C., Dogwood is a non-profit that runs get-the-vote out campaigns for municipal, provincial and federal elections. 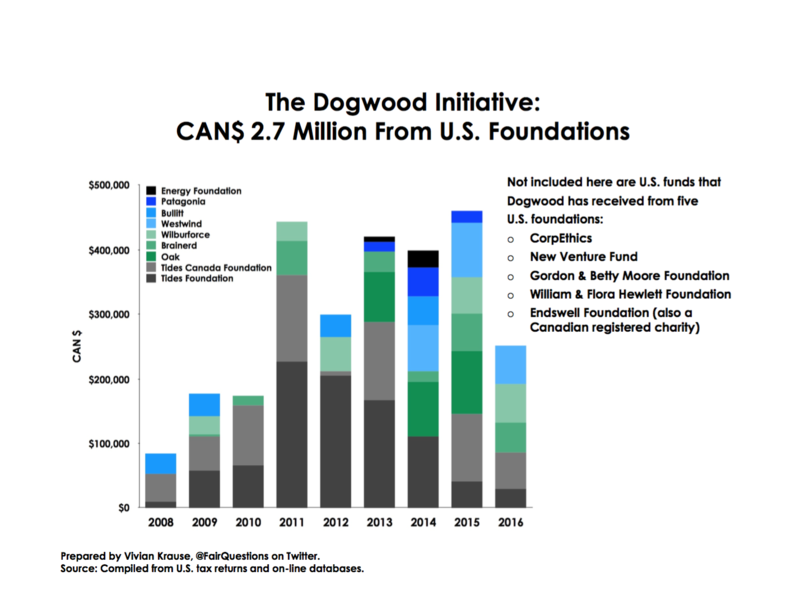 Dogwood is so nakedly political that by its own admission (even as far back as 10 years ago), Dogwood does not quality as charity and yet over the years Dogwood has been funded via at least ten registered charities. For more information, read Who Is Dogwood and Who Funds It? According to calculations based on its annual reports, Dogwood has had $10 million in revenue since 2008. At least $2.7 Million of that is from U.S. foundations that support anti-pipeline The Tar Sands Campaign, tax returns show. And that's not including funds from at least five U.S. sources, including some of the largest U.S. foundations. 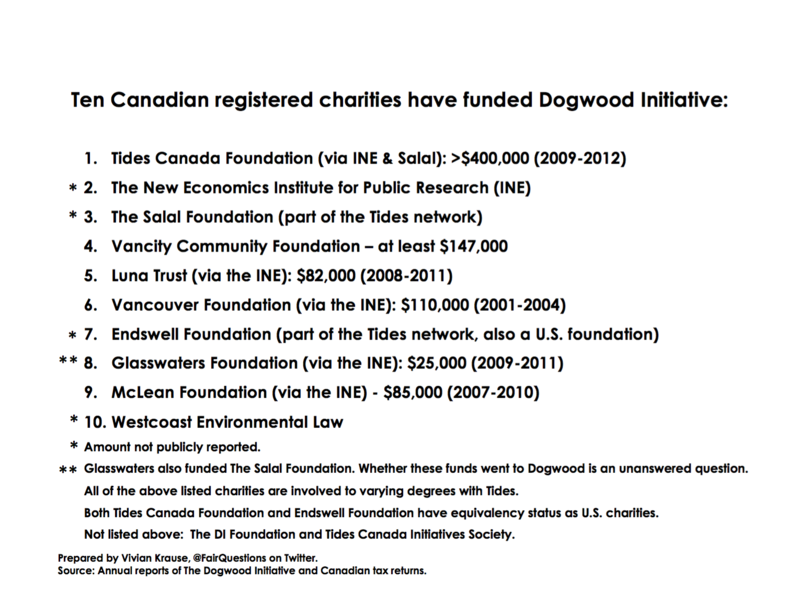 Tides Canada Foundation has granted at least $400,000 to two registered charities that fund Dogwood: Institute for New Economics Public Research ("INE") and the Salal Foundation, and $120,950 to a third charity, the DI Foundation. After 12 years of operation, INE abruptly ceased all financial activity in 2013. Same for The DI Foundation, which had been created only one year prior. The Executive Director of the DI Foundation is Don Gordon. He is also the Head of Revenue of the Dogwood Initiative. As it appears to me, The DI Foundation is a shell. It has no staff, does no fundraising, and since it began in 2012, it has made only one significant transaction: The transfer of $120,000 from Tides Canada Foundation to The Salal Foundation. 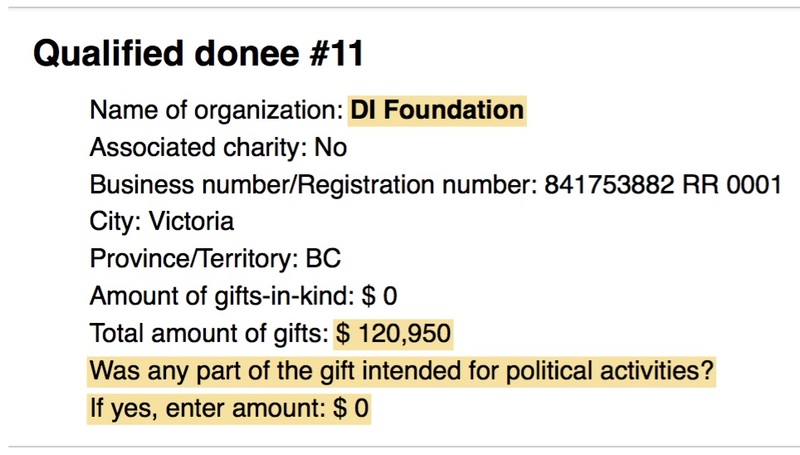 These facts raise a series of fair questions: Why has the CRA allowed the DI Foundation to qualify as a registered charity? And how many of Canada’s 86,000 charities are shell charities like The DI Foundation? Between 2008 and 2012, Gerald Butts was president and CEO of World Wildlife Fund Canada, one of the organizations with which Tides Canada works most closely. During Mr. Butts' tenure as WWF Canada's president, the spouse of Tides Canada's CEO was hired by WWF Canada. 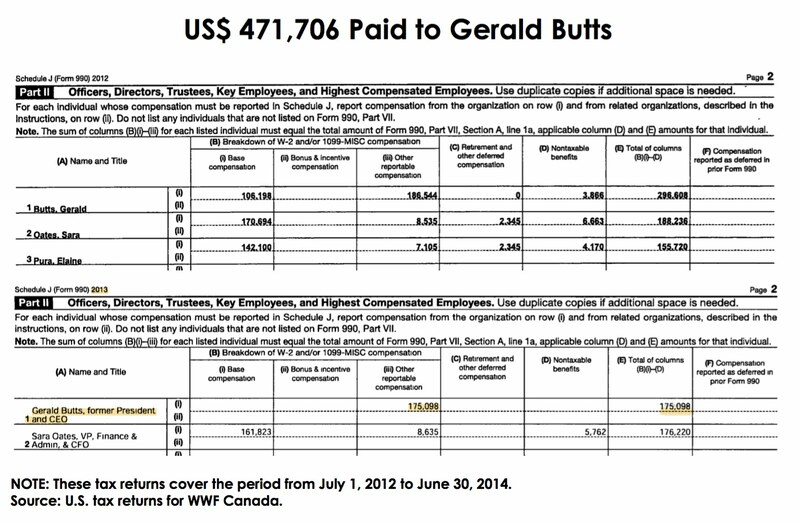 After he resigned to work for Justin Trudeau’s Liberal leadership campaign, WWF Canada paid Mr. Butts US$361,642 in severance. Again, the above-mentioned facts raise a series of fair questions: Does the CRA allow a registered charity to provide as generous a severance package like the one that Mr. Butts received? Isn’t that a bit much? Imagine if the president of The Fraser Institute had resigned to run leadership and election campaigns for Stephen Harper or Andrew Scheer and was paid more than $400,000 in severance. What a scandal that would be! Since 2010, more than 50 charities have had their charitable status revoked for some of the same types of transactions that are described here. And yet Tides Canada, WWF Canada, the DI Foundation and other affiliated charities continue to operate and as it appears, they were not even audited despite the fact that the CRA was given millions of dollars specifically to audit the political activities of registered charities. Not to draw comparisons between Tides Canada and Senator Mike Duffy but imagine the Senate had audited the senators and not audited the senator who was at the centre of the fuss? Again what a scandal that would be. One of the findings that the CRA announced in its preliminary results was that “undue benefits” have been provided to an individual or individuals involved with one of the audited charities. The name of the charity (or charities) that provided the undue benefits was not given. Undue benefits is precisely the concern that was first raised with the CRA back in 2010 with regards to the funds (more than $1 million) that The Endswell Foundation paid to Joel Solomon. For more about that, read this letter to Joel Solomon. If Mr. Solomon and Mr. Gerald Butts are not the individuals to whom the CRA found that undue benefits were provided, then who were? Are these cases of undue benefits that the CRA missed? And if so, why? How many similar cases have also been missed, if any? These questions are fair. 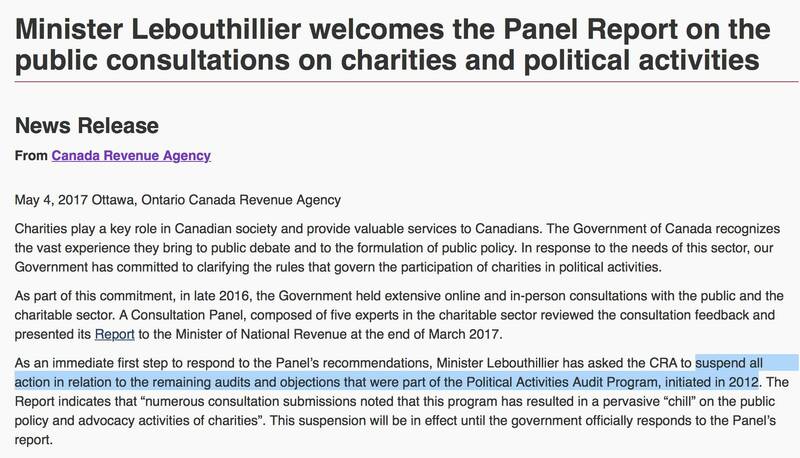 In May of 2017, the National Revenue Minister Diane Lebouthillier announced that the federal government has asked the Canada Revenue Agency to suspend all action in relation to the political activity audits of charities. Asked whether this means that the seven charities that were to lose their status are off the hook, the CRA gave a vague reply (e-mail from Sept. 12, 2017), re-stating what was in the CRA’s press release from May. 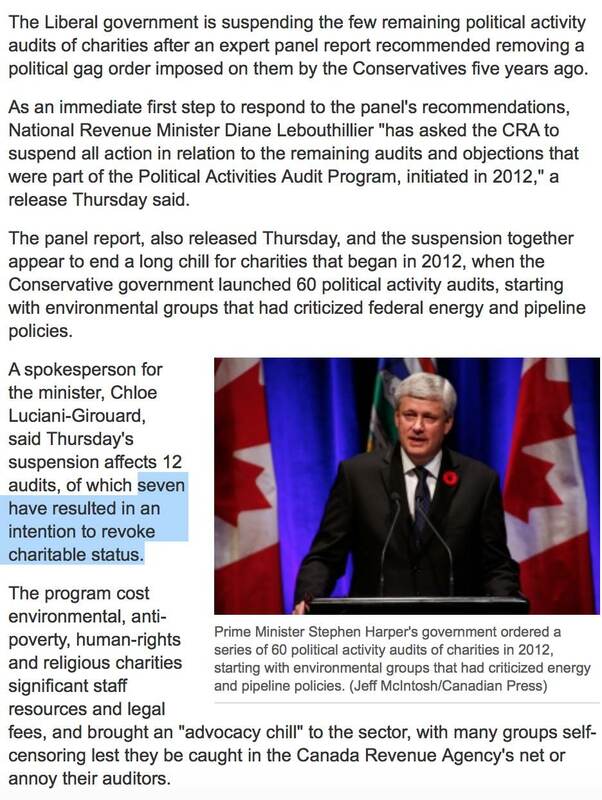 Allowing charities to run amok is at least as wrong as the anti-pipeline activism that prompted the political activity audits in the first place. Furthermore, the Charities Directorate has made a mockery not only of itself but also of the honest efforts of Canadians who provided evidence to the CRA in good faith that due process would take its course. In fact, it didn't.